Our services include wreck/ground sea angling and wreck/reef diving, pleasure trips such as site seeing, bird watching, educational trips and unusual requests like "hen nights". Unlike angling & diving, some of these other services we perform are usually just a few hours duration, but can be varied in time to suit individual requirements. 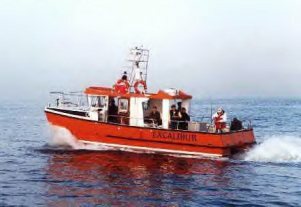 Our vessel may also be chartered for work such as photographic and filming, safety boat for marine events, survey duties, inspections & recoveries and water sampling management. 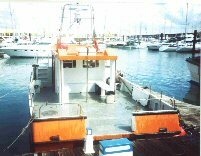 As a M.C.A Brown Code Workboat Licenced vessel we may also be used to carry light cargo to offshore vessels etc. Recent workboat duties include the filming of a documentary for Channel 4 Time Team, and a new war movie to be titled U-555. Prices for angling and diving can be found under PRICES FOR FISHING 2008. Other prices for various services will vary on the nature of the work, with time and distance being the two main factors to pricing. As a general guide our charges start at £60 per hour with a minimum of two hours contracted time. Watch this space for any upcoming offers and special events. To check availability or to book, call the numbers or contact us by email. Prices quoted are all for an eight hour trip. Longer trips can be arranged at an additional cost per hour.